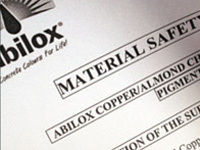 These legally compliant, individual product information sheets, assessed by an external Regulatory Company, cover all safety aspects of our individual products and Ability strongly recommends that our customers read through the relevant sheets to help familiarise with the safety recommendations and procedures applicable to each product. Items covered include: safety equipment and personal protection to be worn while applying the product, the physical and chemical properties, chemical identity, handling and transportation, stability of product, first aid, ecological information and all relevant aspects of the individual product which conform to strict regulation requirements. As with all of our products, Ability strongly recommends to test product first before actual project use, as well as wearing protective safety equipment and to follow safety precautions at all times while preparing, applying or use of the products.